I was lucky enough to be invited to join the blog tour for one of my favourite authors, Eva Dolan. Her latest novel is called Watch Her Disappear. When I read the first of Dolan’s series I was drawn to it because of the setting around the area where I grew up but that soon became a secondary motive for my interest. The series is superb and her latest novel is no exception. 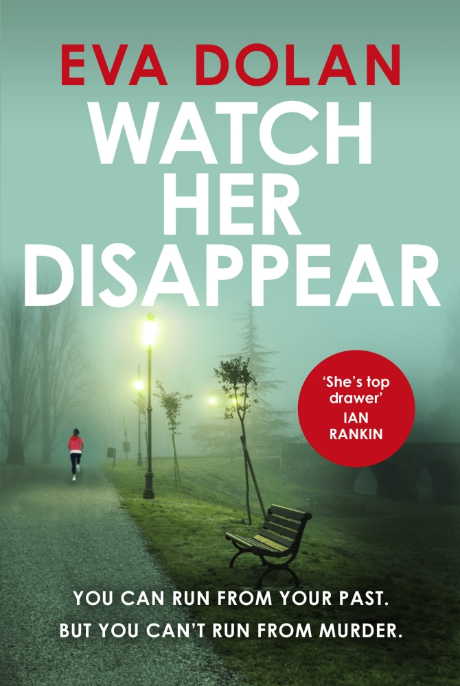 Watch Her Disappear begins with the murder of Corrinne who was attacked whilst out jogging. When DI Zigic and his colleague DS Ferreira from the Peterborough Hate Crimes division are called out they are unsure why. There have been a series of rapes in the area and they assume this is the latest one. It soon becomes clear why they are involved. Corrinne is transitioning from Colin and the murder could be linked to other attacks that have been taking place against the transgender community. Watch Her Disappear is a fascinating novel, dealing as Dolan’s stories do with social issues, prejudice and hatred. The quality of writing is, as always, excellent and deals well with sensitive issues such as transphobia. Eva manages to write about it perceptively without sensationalising the issues, despite focusing as it does on murder. The characters are well rounded, and just like in real life there are sides to all of them, some good and some bad. Personally I think that one of the things that makes these novels stand out are the two main characters. Zigic is the sensible family man who in Watch her Disappear is leading the team through an investigation whilst struggling with the demands of a new baby. Whereas Ferreira is the wild one sleeping with a senior officer and running off with her own line of investigation. They make a great team despite their differences and both draw on each other to move the investigation forward. I also wanted to find out where in Peterborough Eva goes when she is researching. Watch Her Disappear is an excellent novel that I would definitely recommend. It works well as a standalone, and you won’t lose anything by not having read her others. However if you haven’t read the rest of the series I would highly suggest you do. If you want to find out more about the Zigic and Ferreira series, and Eva’s thoughts on Peterborough and the fens, then pop over to Cleopatralovesbooks on the 1st April where I will be taking part in her feature Put A Book On The Map and talking all things Peterborough. Thanks to Eva for her time and to netgalley for my copy of the novel.